194 pages | 12 B/W Illus. 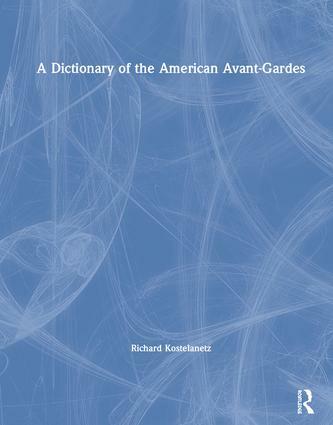 For this American edition of his legendary arts dictionary of information and opinion, the distinguished critic and arts historian Richard Kostelanetz has selected from the fuller third edition his entries on North Americans, including Canadians, Mexicans, and resident immigrants. Typically, he provides intelligence unavailable anywhere else, no less in print than online, about a wealth of subjects and individuals. Focused upon what is truly innovative and excellent, Kostelanetz also ranges widely with insight and surprise, including appreciations of artistic athletes such as Muhammad Ali and the Harlem Globetrotters, and such collective creations as Las Vegas and his native New York City. Continuing the traditions of cheeky high-style Dictionarysts, honoring Ambrose Bierce and Nicolas Slonimsky (both with individual entries), Kostelanetz offers a "reference book" to be treasured not only in bits and chunks, but continuously as one of the ten books someone would take if they planned to be stranded on a desert isle. Richard Kostelanetz is a prominent author and artist. Individual entries on his work appear in various editions of Readers Guide to Twentieth-Century Writers, Merriam-Webster Encyclopedia of Literature, Contemporary Poets, Contemporary Novelists, Postmodern Fiction, Webster’s Dictionary of American Writers, Baker’s Biographical Dictionary of Musicians, Directory of American Scholars, Who’s Who in America, NNDB.com, Wikipedia.com, and Britannica.com, among other distinguished directories. He lives in New York, where he was born.